love your jacket & rowan's little dress! Hope you & your family are safe from the tsunami they are saying is headed for hawaii. My thoughts are with you all. LOVE LOVE LOVE your outfits today! Hello there! I just found your pretty and cool blog. Your baby is amazing. LOVE that yellow jacket; LOVE her little shirt. Hope you guys are ok and safe! Man I really like this look just wish I could pull off the skinny jeans as well. I feel like a giant triangle from the waist down when I wear them. You always look so cute in them! 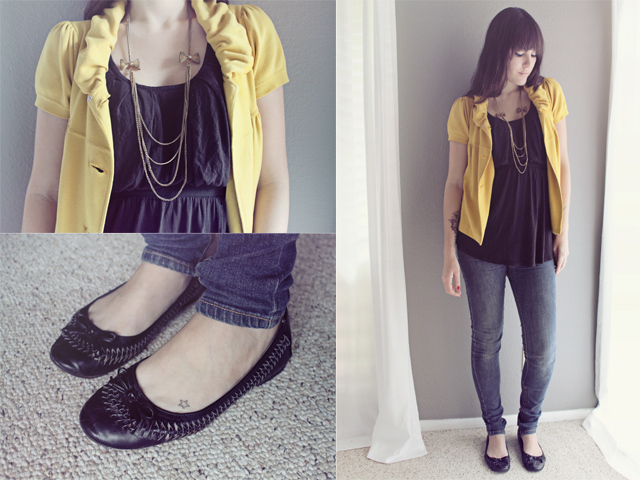 Love the yellow jacket; so pretty & Springy! Aw, you two are seriously the cutest. I love her polka dot top. Little girls are too fun!